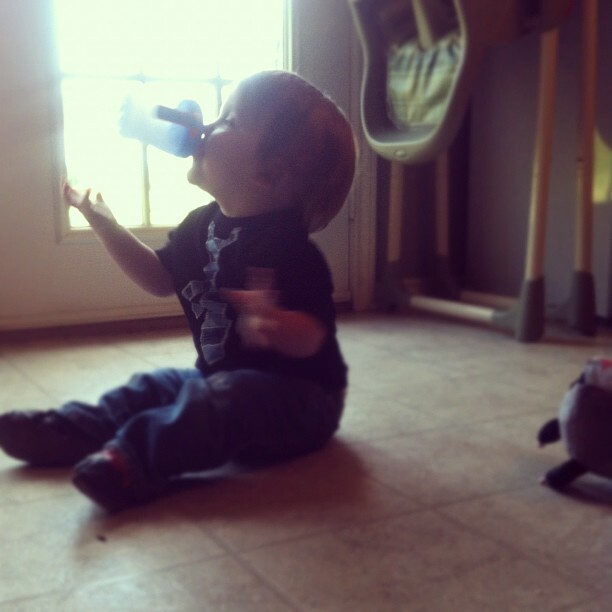 "If I can free up my hands when drinking milk, I never have to resist the urge to dance!" Flashes of vivid memory came to me this morning. There was October 1, 2007, when I left Nathan at day care for the first time. I hurriedly handed him off and ran out, only to return moments later with a tear-stained face and a bag of forgotten bottles. Then there was a May day last year, when Owen met Nanny. I was more prepared for my second round of day care beginnings, so my finger only pushed the doorbell once. It was harder than expected. The remainder of my time wasn't spent well either day. When I got to work, I sat in front of a computer screen with eyes glazed over. I was panic-stricken and frozen with fear. Unfortunately, I am there again today. This morning I crossed the threshold of Nanny's house with a baby on my hip and a little box in my hand. I gathered all the caretakers in a room and gave a quick EpiPen demonstration. I told them where to give it, why to give it, and how to give it. I told them to play with the trainer as often as they wanted. They told me no kid in their care would ever eat peanut butter again. I was happy with that information, so I left. However, halfway to work my stomach managed to twist into a perfect knot. My mind was a blur of possible misunderstandings. I could see my baby, crying and red-faced. "Did I really show them how to use it or did I rush? Do they know to still call 911 if they ever have to use it? Were they even paying attention?" It's like starting over. It's like dropping Owen off for the first time and worrying whether his sitters are capable. Now that we know about an allergy that's potentially life-threatening, that worry has grown exponentially. "Can they keep my baby alive?" As I write this hours later, I know the answer is yes. The anxiety is waning, but I'm ready. I am ready to see my baby whole and well, with cheeks the color they were this morning. I knew Owen's first spring break couldn't last forever. I had to fill my second EpiPen prescription and release him into the care of another. I wouldn't do that if I didn't trust. Unless our dream comes true and he outgrows it, the fear won't dissipate. For now, though, I will take it day by day. 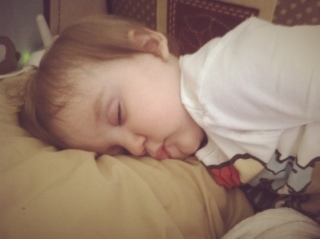 When I get Owen home, I will wrap him up in my arms and know that he is as safe as possible. We will soak in the sun, we will rock in the living room under the hum of the ceiling fan, and we will read all the food labels. It's the last weekday of Spring Break. 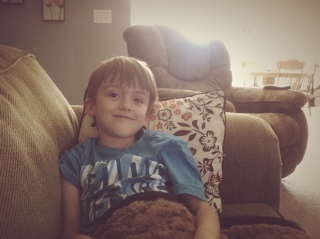 One is snuggled with me on the couch as we watch hours of PBS Kids. The other is drooling in his crib. The house? Littered with toys and dirty clothes. We are doing it up right. Have a great day, y'all. that right there is a kid after my own heart. On sunny Saturday the Bauer clan took Grammy and Poppy to the Jonquil Festival in Old Washington. We missed this event the past three years due to childbirth and/or thunder storms. The 2012 festival, however, was awesome. The weather was amazing and we told the boys we had two goals: to purchase crafts and devour all the fried things. We accomplished both with little effort. We came home with a handmade spinning top, a PVC pipe bow with wooden arrows, and a tummy ache. :) I could go into details about the fun we had at this southern-fried tribute to my favorite bloom, but I think I'll let the pictures do the talking. I hope you enjoyed the fantastic weather this weekend and got a bite or two of funnel cake if you were in the area. if this was the only thing at the festival, nathan still would've been thrilled. always time for silly faces. baby owen was content to stroll around. nathan really wanted a caricature, but holding still was tough. he told stories of how each of the fish were related. nathan was happy to take the obligatory festival photo, despite the lack of jonquils. "Not to worry, guys, my body is back to a normal color and my chubby cheeks are due to genetics, not peanuts." So almost 48 hours since we learned about Owen's not-so-fun fact and all is coming back to normal... or our newest version of normal. 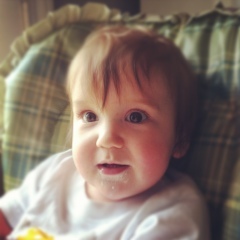 Yesterday, just one day after his reaction to peanut butter, he woke up looking like a marshmallow man. 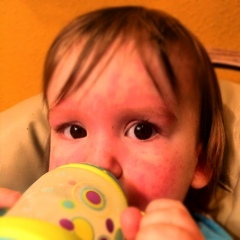 His face was completely swollen, which prompted a pediatrician call and a prescription antihistamine. As shown in the photo above, that is no longer the case today. My baby is feeling much better. Thanks for all the prayers and calls/texts to check up on him. We are slowly becoming educated on what this means for us and we will likely know a lot more after his 12-month visit next week. 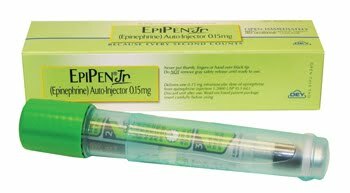 In the meantime, if you'd like an EpiPen lesson or a run-down on which restaurants use peanut oil (RIP, Chik-fil-a), I'd be happy to oblige. Have a great Friday, y'all! I've never been angrier at a food. When I picked Owen up from daycare, something was off. He was crying and it looked as though he had eaten a red Popsicle. I asked and his sitter said the last thing he had was a delicious snack of bananas and peanut butter. 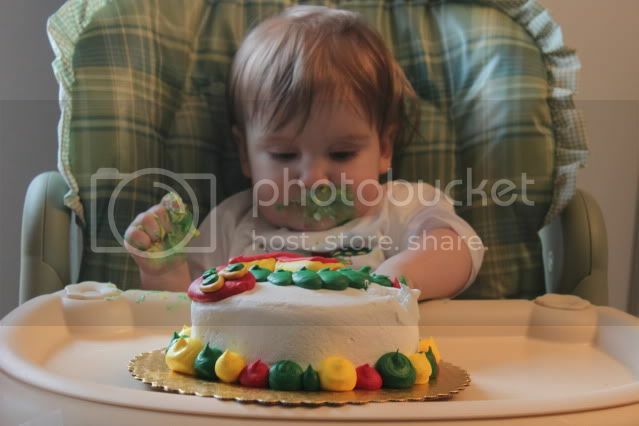 Seemed like the perfect treat for a one-year-old. Heck, it's one of my own favorite combos. Then I thought about it. And I figured it out not a mile down the road. Baby O has discovered something new. 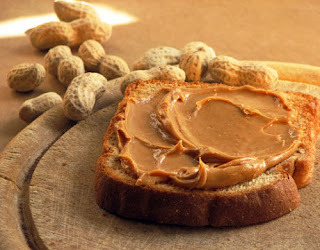 A peanut allergy. I rushed him to my mom to make sure she saw what I did and she contacted her pediatrician neighbor right away. Thankfully, his office let us in. Owen was worsening by the minute. Hives spread fast across his face and encompassed every inch of his sweet body. His back was a mass of welts with no space between. He was miserable, itching like crazy and begging for relief through whimpers and cries. Eventually he got a shot of epinephrine and a dose of Benadryl. Hours later the hives started to calm and I exhaled. 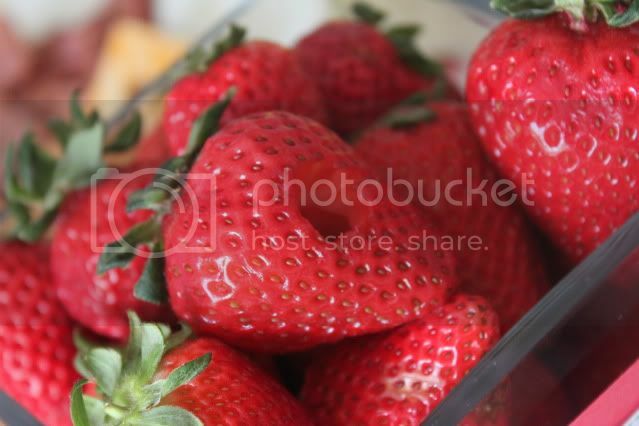 He's still strawberry red and puffy, but his happy demeanor has returned. As for mama, I've got a brand new baby epi-pen and an unsettling fear of peanuts. This shook me hard, but I thank God Owen is okay. We were blessed to see a doctor immediately and that his reaction wasn't as bad as it could've been. This time, I sincerely hope your day was better than mine. Pray that Owen makes a 100% comeback as quickly as possible. 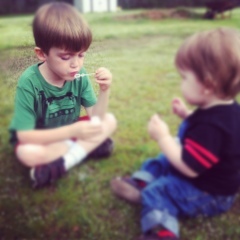 Nothing new here, just a few moments in the grass, watching Nathan blow bubbles and Owen pop them. Perfect way to unwind after Nathan's first t-ball practice. 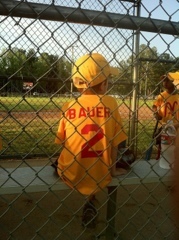 Swinging a bat, running to a base, and following butterflies can be pretty tiring work. Happy Tuesday, friends. Today was the first official day of more sunshine and less sleep, so we made the most of it. (No, yesterday's day-long rainfall didn't count). The light was warm and perfect this afternoon. That means you get treated to a few cheesy grins from this sweet baby. Unfortunately, we couldn't drag Nathan away from Sonic on the X-Box until after dinner, but you understand these big-kid things. :) Plus, the fact that we were still able to play after dinner was great. I hope you made the most of your extra daylight and didn't grumble too much this morning when your body knew the truth behind your 6:30 alarm. Happy Monday, y'all! The streamers are still hung and balloons still float across my living room, but Owen's first birthday is officially in the books. What a party we had! I'm so thankful to all the friends and family who came out to make it such a success. As you've figured out, "The Very Hungry Caterpillar" was our theme of choice. 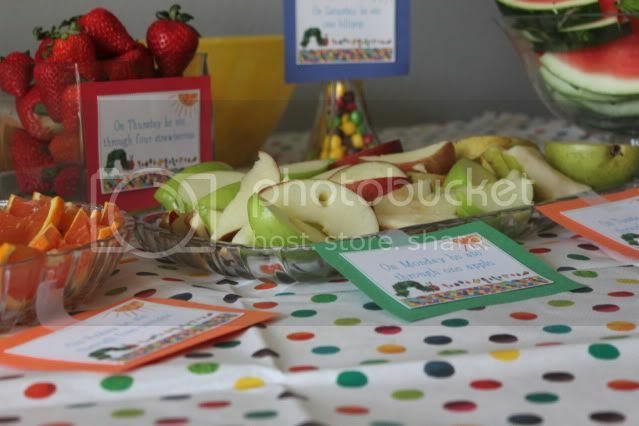 Primary colors filled the room with candies, lollipops, and an overloaded bag of decor from the party store. 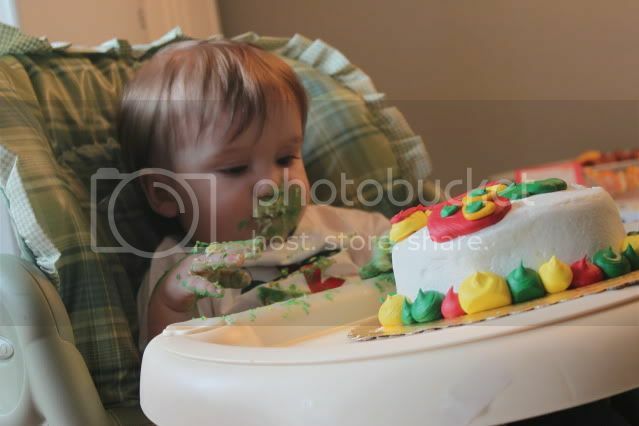 As you saw in yesterday's post, there was no testing the waters for Owen when it came to cake time. He did that smash cake justice. Once Owen was hosed off, we played with his new toys, then kicked back to enjoy the after-party buzz. (or perhaps that was the chocolate cake??) Either way, as of 11:46 last night, my baby is a one-year-old. I can't call him a toddler just yet, as he hasn't taken those first steps. That's okay, though, I don't mind calling him Baby Owen for the time being. I hope your weekend was just as great and we missed you if you were unable to make it. (If you did miss it, just click here for an entire Facebook album full of birthday fun.) Have a happy Sunday, y'all. 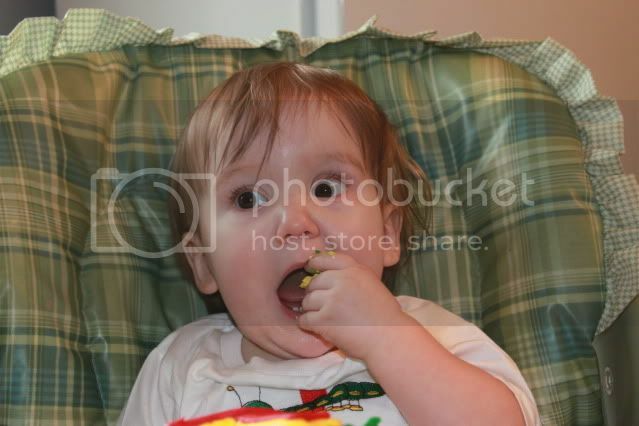 And Owen didn't hesitate to eat it, too! What a fantastic first birthday party for our little caterpillar. We celebrated with friends and family, opened tons of noisy, fantastic presents, and dove head-first into the smash cake. 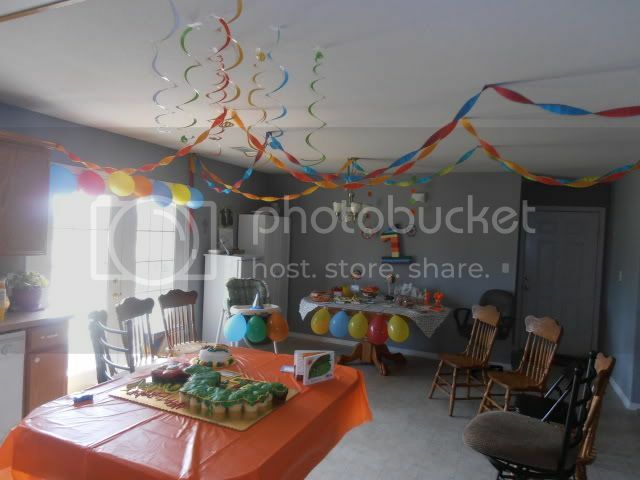 The party is still going, but I thought I'd throw a little preview picture up for the world to see. Don't you worry, though, the full details are coming tomorrow. Happy birthday to my incredible one-year-old, the amazing Owen Charles. You light up my life and make all those around you glow with happiness. I'm proud of the kid you're becoming and I'm thankful for the baby you've been. You have made my heart grow in ways I can't describe. I love you so much, Baby O! This morning, my brain is filled with memory. On this day one year ago, I was enormous. My body was full and three days overdue with a stubborn, long-waited-for baby. I was ready to meet him, but he wasn't quite ready to meet me. It would be two days before his eviction, but I remember. I wanted him so badly and the minutes dragged. I would not know if he was whole or well until I saw his face and the word "overdue" wasn't helping those anxieties. On this day two years ago, I was grief-stricken. It would be two days before my doctor confirmed what I knew, but I knew. I knew my second pregnancy had ended in loss and I knew the coming days, weeks, and months (eventually years) would be filled with spurts of sadness. I knew I would get pregnant again and I knew my sweet Owen would come to me, but I had to deal with this first. In 2010, I wanted March 10 to stay away. Hope was lost and I knew what my doctor would tell me that day. It was hard and it still is. In 2011, March 10 couldn't arrive soon enough. I would be a few days closer to holding my sweet newborn (or perhaps holding him already!) Now, in 2012, March 10 is coming and it's welcomed. My baby boy will be a year old Saturday and although it's hard to see him grow up, I am excited to celebrate this anniversary of life. I'm also excited to remember why he's here. This is a rehash of what I've discussed time and time again, but it helps to remember where we've been and where we're going. You can't move forward without looking back. And don't worry, it's my baby's birthday week. There will be *lots* of looking back around here. :) Thanks for reading. Since March came in more like a summer day than a lion, we grabbed our garden plans and vegetable seed packets. The tiller has been running all week, dirt has been turned and compost has been mixed. Today was the perfect opportunity. Each of our palms were lined with seeds as we broke through the earth to create new beginnings. In our spring bed we sowed sugar snap peas, carrots, a romaine-type lettuce, and a salad mix. This is the earliest we've begun our vegetable garden, but this is also our first attempt at getting in some cool-season crops before the brutal summer sets in. In the coming days and weeks we should have lots of little babies to care for, worry about, and photograph. Stay tuned. Happy March!